Lennart Rieder participated at Coup de Ville 2013. This text was published in the catalogue. Rieder studied at the Art Academy in Kassel and, by means of the Documenta exhibitions and the artists living there, came to the realisation that he should explore the world. He opted for various residencies and education programmes abroad, including in Ghent. Currently, Rieder resolutely has chosen to explore painting. He combines motifs from art history with natural forms, but estranges them from recognizable reality through his use of colour and material. In so doing, he does not aim at the pleasing, attractive or decorative; his goal is to create an atmosphere of entrapment, deception and discomfort. 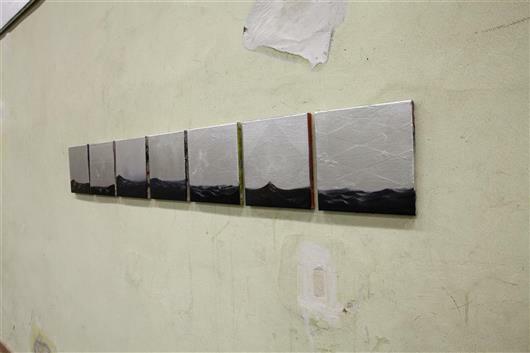 He is currently experimenting with the impact of different formats – their effect within the presentation space as well as on the viewer. 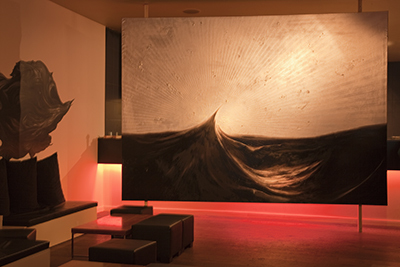 In response to a mural created by Stephan Balleux in the restaurant Eigenwijs on the occasion of the first edition of Coup de Ville, Lennart Rieder has realized a large painting on canvas that he leans up against it. He describes it as a large billboard that is oversized or ‘disproportionate’ in relation to the interior. Rieder is responding to two givens: the pattern of expectation as to how a painting should be presented and the visual signals that demand all one’s attention in public space, which is something he questions. Polluting signs, logos, signals and images function in public space like a hidden persuader – they are not noticed consciously, but determine our image of the city and influence our thinking and undoubtedly our actions. By means of the scale and positioning of his painting, Rieder creates a signal that one cannot avoid. His design is based on a traditional genre: a maritime scene, but is developed using unorthodox materials. As a graffiti artist he began creating images years ago that looked like ‘paintings’ from the ‘real’ art world – which he then still had to explore. He has now made a painting with a special covering spray that is used to remove graffiti vandalism. In dialogue with the mural by Stephan Balleux (whose painting represents a tag) a relationship is also established through the use of material through the use of material with the street which is sucked inside.